Don't Throw Away Silica Packets. They Come In Handy Around The House. Why do Silica Gel packets say "Throw Away", when they're so useful? 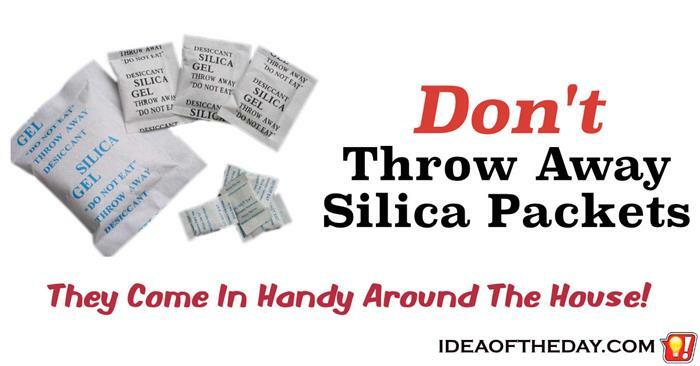 There are a lot of products today that are shipped with Silica Gel packets inside the box that say "Silica Gel - THROW AWAY- DO NOT EAT" on the wrapper. The main purpose these packets is to absorb moisture, so they keep whatever they are shipping dry, which is especially important when shipping electronics. Since they look a lot like a packet of sugar, I can understand why they write "DO NOT EAT" on the side, but there's no reason why they also say "THROW AWAY" too, especially since they're so handy around the house. I've been saving them for years to keep things like tools, cameras and other things free of humidity, and I never run out of places to use them.